Strawberries were the fruit of my youth. In the summertime, they were consumed almost daily. We would chop up the strawberries and mix them into a bit of vanilla ice cream (topped with a generous dose of chocolate syrup, of course). On special occasions, they were spooned on top of angel food cake and topped with a dollop of whipped cream. Usually, though, we ate them simply—sliced and sprinkled with a spoonful of sugar to make them sweet and ooze strawberry juice. I never could resist liking that bowl clean. One of my favorite bedtime snacks was the classic strawberry smoothie. I would sip them up on hot summer evenings. The chilled drink would always cool me down until I got goosebumps. The taste was close enough to a strawberry milkshake that I felt like I was getting a special treat even though my smoothie was anything but unhealthy. Mothers are good at tricking you like that. Nowadays I tend to enjoy them while strolling around outside or for a light breakfast when I'm on the go. One of my favorite qualities of smoothies is the versatility. They are perfect for all hours of the day. Morning, afternoon, or evening, you can always enjoy this understated treat. 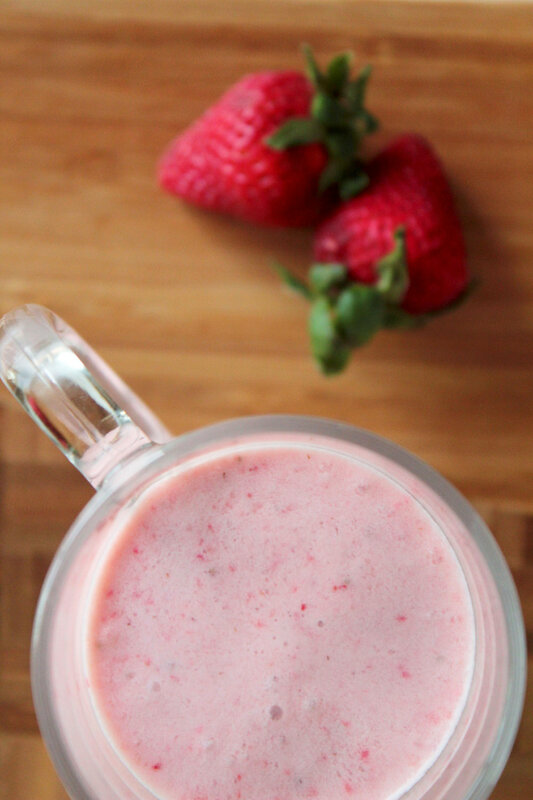 This strawberry smoothie is a light, fruity drink that will satisfy any sweet (or health conscious) tooth. The base of the smoothie is low-fat vanilla yogurt and milk. Strawberries and ice provide a nice variety in texture, while a splash of vanilla extract will help round out the flavors. Remember, you control the amount of sugar in the drink. If you're afraid it may be too sweet (or you're watching your sugar levels), add a little sugar at a time until it is just right for you. In a blender, blend together all ingredients. Serve cold in chilled glasses.